QiField Therapy is a psycho-energetic method that combines the Qifield Technique with SE™ to help regulate the nervous system out of shock or traumatic stress. QiField Therapy works both on the internal energies of the body and nervous system while creating a safe and harmonious environment for the blocked energy to release. The Qifield Technique also helps the therapist to glean information about the substance, energy and information concealed within a client's symptoms such that their underlying causes can be more quickly released and harmonized. SE™ is not psychotherapy or psychiatry, it is a naturalistic healing process developed by neuro-physiologist Peter Levine that relies on the functioning of the autonomous nervous system. SE™postulates that events in themselves are not traumatizing, the trauma results from the incomplete self-protective responses that remain as energy blockages in the body. 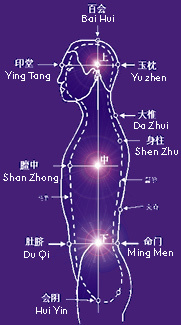 At its root, SE™ works on the exact same energetic principles as Zhineng Qigong. We can help you release the undelying blockage in your nervous system so that you can bounce back to vibrancy and fullness. Somatic Experiencing is a form of therapy aimed at relieving and resolving the symptoms of post-traumatic stress disorder (PTSD) and other mental and physical trauma-related health problems by focusing on the client’s perceived body sensations (or somatic experiences). It was introduced by Dr. Peter Levine in 1997. He presented at length his observations of animals in the wild, and how they deal with and recover from life-threatening situations. He concludes that their behaviour gives us "an insight into the biological healing process", and that "the key to healing traumatic symptoms in humans lies in our being able to mirror the fluid adaption of wild animals" as they avoid traumatization in reacting to life-threatening situations. The theory postulates that the symptoms of trauma are the effect of a dysregulation of the autonomic nervous system (ANS). It further postulates that the ANS has an inherent capacity to self-regulate that is undermined by trauma, and that the inherent capacity to self-regulate can be restored by the procedures of Somatic Experiencing. The procedure, which is normally done in a face-to-face session similar to psychotherapy, involves a client tracking his or her own felt-sense experience. Practitioners of Somatic Experiencing are often also psychotherapists, Rolfers or BodyWorkers. Certified practitioners must complete a training course that spans three years. The procedure is considered by its practitioners to be effective for Shock Trauma (see below) in the short term (typically one to six sessions). It is also considered effective for Developmental Trauma as an adjunct to more conventional psychotherapy that may span years. Somatic Experiencing attempts to promote awareness and release of physical tension that proponents believe remains in the body in the aftermath of trauma. They believe this occurs when the survival responses(which can take the form of orienting, fight, flight or "freeze") of the ANS are aroused, but are not fully discharged after the traumatic situation has passed. Somatic Experiencing uses procedural elements that have been said to work anecdotally, but have yet to be subjected to a double-blind study. The process involves a guided exploration of the nature and extent of the physical dysregulation that is harbored in the body as a result of trauma. Techniques include "titration" of the client's experience. That is, in the initial steps of the procedure, the client is only exposed to small amounts of their distress at a time, until they develop tolerance and the capacity to handle more. Another idea is that the client's experience should be "pendulated". 'Pendulation' refers to the movement between regulation and dysregulation. The client is helped to move to a state where he or she is believed to be somewhat dysregulated (i.e is aroused or frozen) and then helped to return to a state of regulation (loosely defined as not aroused or frozen). This process is done iteratively, with progressively more levels of dysregulation believed to be resolved by the client in successive pendulations. "Resources" are defined phenomenologically as anything that helps the client's autonomic nervous system return to a regulated state. In the face of arousal, "discharge" is facilitated to allow the client's body to return to a regulated state. Through this process the client's inherent capacity to self-regulate is believed to be restored. Somatic Experiencing is considered by its practitioners to be useful for two broad categories of trauma: shock trauma and developmental trauma. Shock trauma is loosely defined as a single-episode traumatic event such as a car accident, earthquake, battlefield incident, etc. Developmental trauma refers to various kinds of psychological damage that occur during child development when a child has insufficient attention from the primary caregivers, or an insufficiently nurturing relationship with the parent. 1. Orientation to the here-and now within the external environment as a felt sense within the organism, and engaging in social interaction (i.e. cooperation, reproduction, feeding, etc.). 2. Alerting the nervous system of impending danger, re-directing energy within the organism to prime for action, and warning others in the group with us. Research has shown that this system works beautifully in all animals including humans. However, it is clear that animals are not traumatized by these experiences while humans are. The reason for this lies deeply embedded within the development of agricultural and later industrial civilization. Beyond a critical number of individuals in a group or tribe, the bottom-up processing implied above begins to become disorganized. Humans have developed rules and regulations to inhibit their natural organic responses to stimuli (as initiated within the neo-cortex), thereby disorganizing the procedural execution of instructions within the ANS. People now chronically suffer from accumulated stress and non-specific syndromes relating to situational or developmental trauma that were unheard of even in the recent past. Humans’ neo-cortex have unwittingly moved away from the genetically programmed bottom-up processing of the ANS where every action arising within the basic structures of the ANS and felt sense of the body propagates ‘upward ‘ to the neo-cortex and to phase-appropriate response. In the ‘modern’ top-down modality of processing (literally an inversion of the functional reality of the organism) we find ourselves ‘rationalizing’ or trying to co-opt our natural responses, resulting in the inhibition of our self-protective and self-nurturing responses via coercive measures processed within the neo-cortex. The net result is behavior inappropriate to the phasic nature of the ANS and inappropriate to the demands of the environment. This results in accumulated or chronic stress as the organism begins to bind its energy of activation as syndromes that manifest in the body/mind complex. SE™ works by restoring the bottom-up processing of the ANS and eliciting the arousal of what is called observer within the systems of the organism. The aim of the process is to discover, identify and then re-negotiate the energy of arousal within the ANS so that it can be safely discharged without resulting in overwhelming emotion (freeze). The process of restoring the ANS and organism to phase-appropriate coherence results in the return to organic natural self in harmony with the environment and others. The net effect is a re-establishment of the triune organism’s (mind, feeling and instinct) innate ability and resourcefulness to fully orient to time and space, the here-and-now in which the organism awaits recognition and embrace. The mind is capable of entering into a relationship with the body through active sensation. The resulting interaction engages the primary functions of the human body: Mind, Feeling/Emotions, Physical/Somatic perception. The unifying factor in this action is INTENTION or WILL to heal. The blending of these different levels causes the whole complex to relax and open to the Qi (pure energy) surrounding us in Nature - of itself in a continuous state of harmonious balance. The Intention to heal can bring a person's mind into direct contact with a bodily feeling. This may in turn elicit the perception of an emotion. The mind's intention blends with the bodies' structure and organs, and further with the emotions that arise out of tension and relaxation. By using the mind, feeling and body together, a fourth activity is initiated that results in healing or integration: intentional blending, relaxation of concepts and barriers, and openness of the mind/feeling/body to return to its natural integrated state.